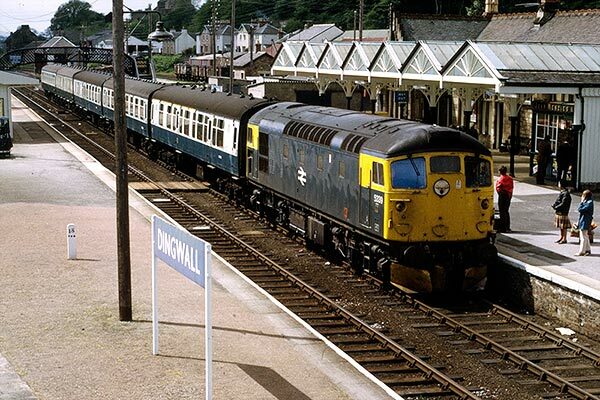 Caption - British Rail class 26 5339 is seen at Dingwall station in northern Scotland with an Inverness to Kyle of Lochalsh train in June 1973. Forty-seven examples of these 1150 hp Bo-Bo diesels were built in 1958 and 1959 and they spent most of their life in Scotland until withdrawal was completed in 1993. Today Britain's railways see very little loco-hauled passenger and the scenic line to Kyle of Lochalsh is served by 2-car class 158 DMUs.